Integrity is both a “now and ongoing” kind of thing. Something that we should strive for NOW, and something that is part of our sanctification. I think we’d all have the desire the live a life of integrity, even those on the fringe of our culture. But this idea seems ambiguous at times, and judgmental at other times. What does it really mean, to live a life of integrity? Walking the Talk? Being morally upright? Or just right? If your goal is just to be right, and feel right – go for it. True integrity involves more than this. It encompasses both moral soundness and innocence. I remember parenting during those lovely teen years. Oh, the struggles I had with my children. Their rebellion and disrespect touched broken places in me. My pain was activated, and I lashed and behaved very poorly, hardly living a living a life of integrity. My goal was NOT to be innocence. I was right and I wanted to win! Don’t need to take it personal? Wait, wasn’t it personal? Felt personal to me! It was a stressful season, and my anger and furious raging made an already bad season, worse! Exasperated, I realized that the answer lay with me. I remember God telling me, that the situation would never get better, until ONE person STOPED. And since I was the adult, I was chosen … To. Stop. Fighting. A simple answer to a complex situation. Interesting that the word “simplicity” is found within the definitions of the term Integrity. Moral soundness, an undivided or unbroken completeness or totality, wanting nothing. Wholeness, simplicity. In this unsettled world, many of us are not behaving with integrity. Let’s admit it – life is complex, and nuanced. The “old school” right and wrong don’t appear to apply anymore. We are all so very attached to our opinions, we treat them as truth. Behaving with integrity sets us apart from the world. The goal of integrity is not to be “right,” the goal is to be like Him. 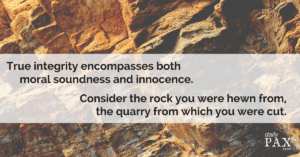 WHO is the rock we were hewn from? Christ. He set the example for us! He was kind, forgiving, and always 100% present to each person He spent time with. He was extremely gentle with those living in the lowest ranks of their community, and patient with those who had deep questions and those who held conflicting viewpoints. The only people He treated harshly and judged, were the religious leaders who were misusing their power and authority. Integrity, is more than being right, it is remembering the example of Christ. Our goal is to emulate that example, remembering the Rock we were hewn from, and the Quarry from which we were cut. Join the dailyPAX community – Get more PEACE in your life — today!